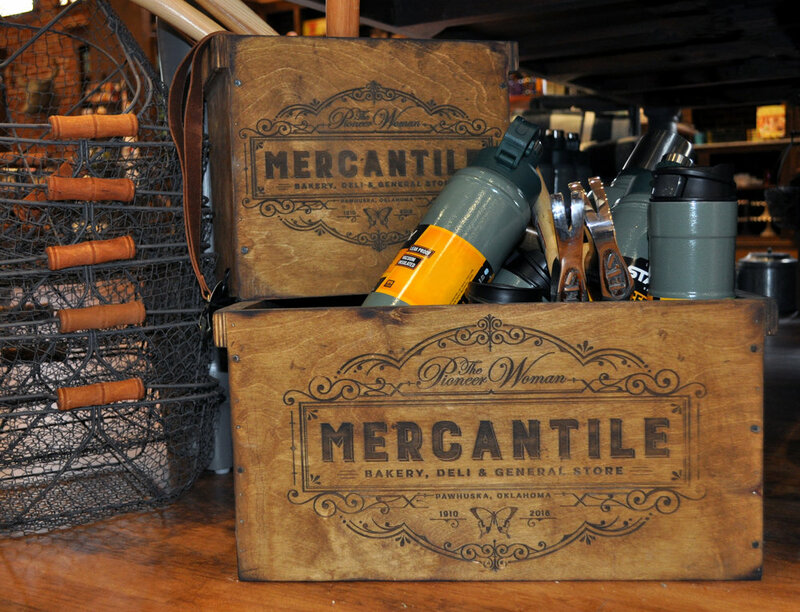 The Pioneer Woman Mercantile is a 30,000 sq. ft. destination— general store, bakery, and deli of the celebrity chef and author Ree Drummond. Ree Drummond is The Pioneer Woman, a inter-national celebrity chef, author, and host of her own cooking show on The Food Network. She recently opened up a 30,000 sq. ft. mercantile in her home town of Pawhuska, Oklahoma. Yvonne and Ree have been working together for 10 years. In the beginning, re-styling her name lock-up, creating recipe cards, and designing monthly illustrate web banners for her popular blog. Later projects included, Ree’s Tasty Kitchen website design, cookbook covers, advertisements, and dishware. Design a brand that paid homage to The Pioneer Woman and the era of the 1900’s (the building first became a Mercantile in 1910). Make the brand fabulous, old-timey, and include a butterfly! Inspired by vintage signage and labels of yesteryear. The main mark is a mixture of simple typography paired with the original Pioneer Woman logo type. Capsulated in a crest shape, this mark is reminiscent of classic sign painting, and the wrought-iron signs you may have seen strolling Main Street in the 1900’s.